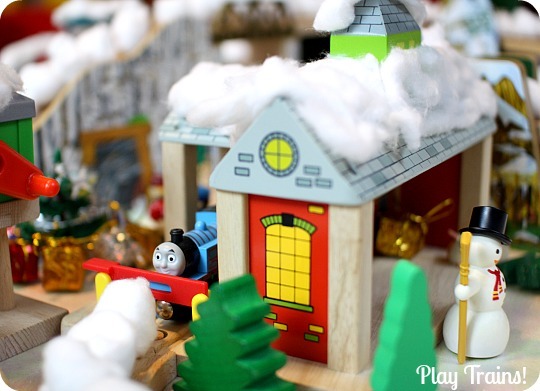 For the final day of Christmas Play Days, I wanted to share a Christmas wooden train layout I surprised the Little Engineer with on his train table last year. 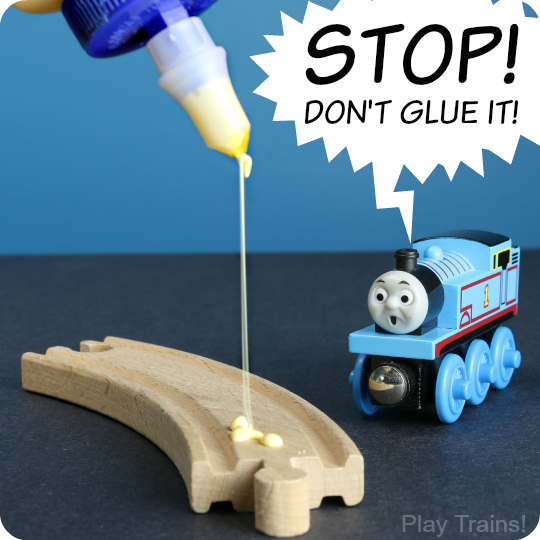 I really enjoyed finding little toys around the house that helped set the scene and encourage imaginative play. And I always love adding any kind of snow to a train set! 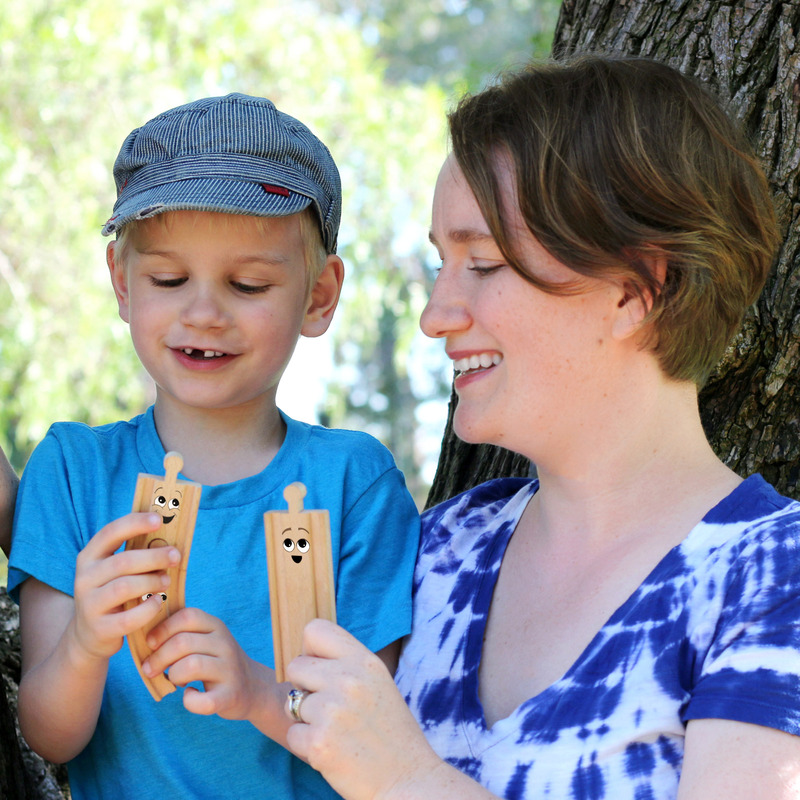 Make sure to check out today’s Christmas Play Days activities from my fantastic friends, Shaunna from Fantastic Fun and Learning, Rachael from Nothing if Not Intentional, Chelsey from Buggy and Buddy, Mary Catherine from Fun-a-Day!, and Ann from My Nearest and Dearest! The Little Engineer loves “surprise train layouts”, so this was really fun for him. 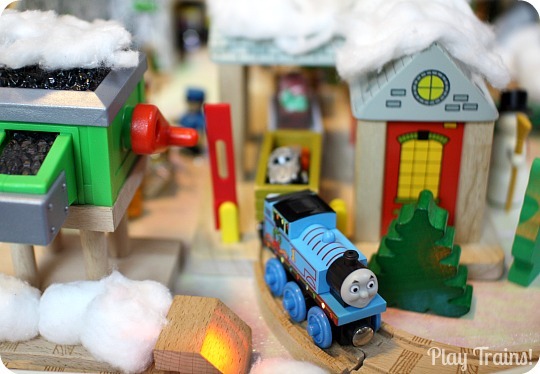 Between the snow to plow off the tracks and the toys for Thomas to deliver, he spent a lot of time playing at the train table for the two weeks before Christmas. 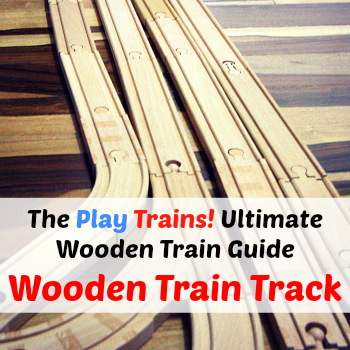 We used wooden trains, but you could easily decorate a Trackmaster, Take’n’Play, or any other type of toy train layout. 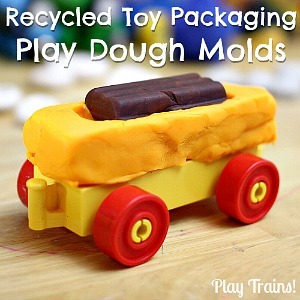 I focused on a freight train loaded with Christmas toys. Runnning passenger trains transporting people (or elves) on their Christmas travels would be a lot of fun, too! 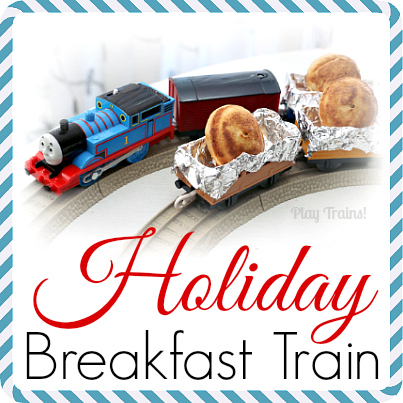 I’ll talk about what I used to make this train layout, but consider the photos and information as general inspiration to use what you have to add some Christmas cheer to your toy trains, whether it’s just a pile of “snow” or a little Christmas tree or a whole train table like ours. 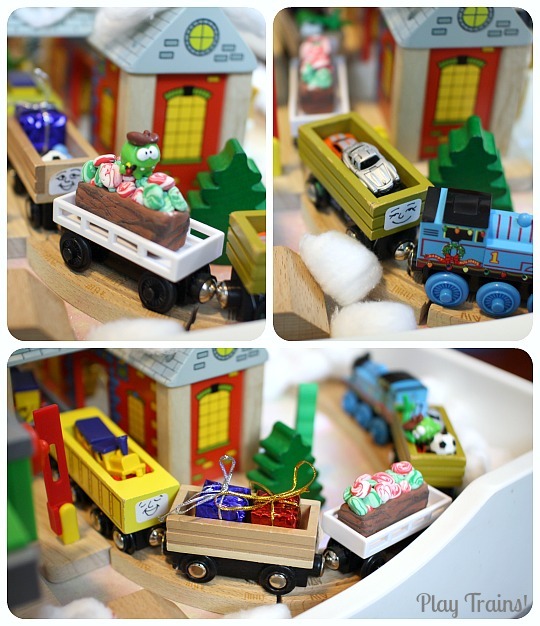 I really enjoyed adding the Bigjigs station and shed, and the coal hopper from this Thomas set, which looked quite Christmas-y with their reds and greens. Before building the layout, I spread iridescent wrapping paper on the train table for snow on the ground, and then I added cotton balls to the tracks (a trick I picked up from No Time For Flashcards’ Winter Train Table Sensory Play) and the tops of the buildings. You can kind of pull the cotton balls gently apart and stretch them so that you have a longer, flat piece of cotton fluff to put on the roof tops. 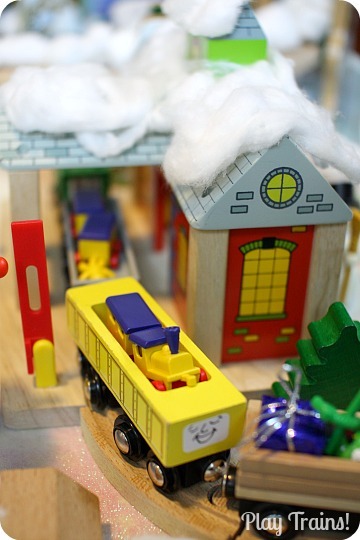 For more ideas for adding snow to train layouts, read Snow Trains: Seven Ideas for Bringing Snow into Train Play. Anything small enough to fit in a freight car will work here. I just looked around the house and used things we already had, with the exception of the little foil-wrapped presents from the craft store. I was lucky in that, long before the Little Engineer came along, I had bought myself a Playmobil advent calendar because I thought it was adorable. 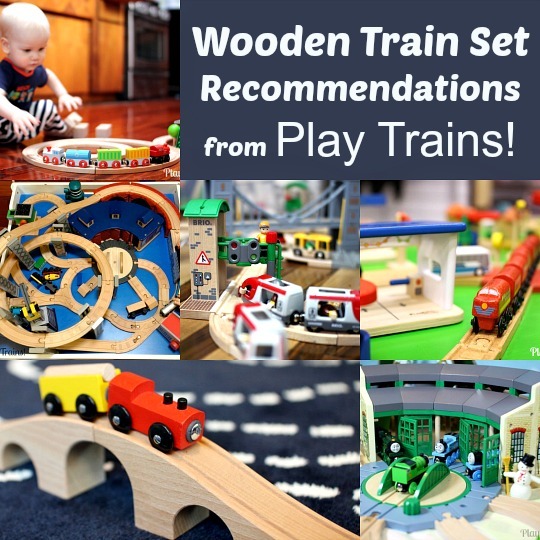 All of the little toys that came with it were the perfect size to go with our wooden trains, including Santa and his sleigh full of toys, the Christmas tree, and the winter woodland creatures. 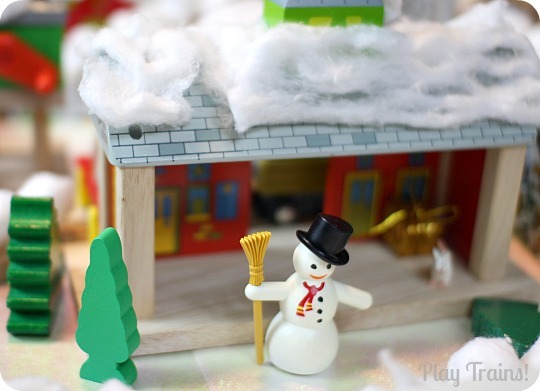 There seems to be a lot of adorable Playmobil Christmas stuff! 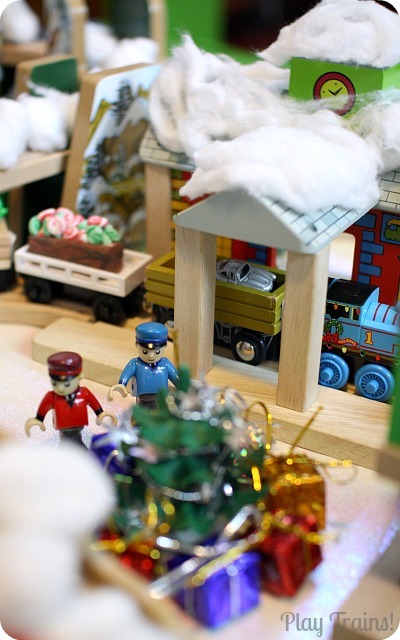 The people in the scene (other than Santa) are figures that came with Brio train sets. 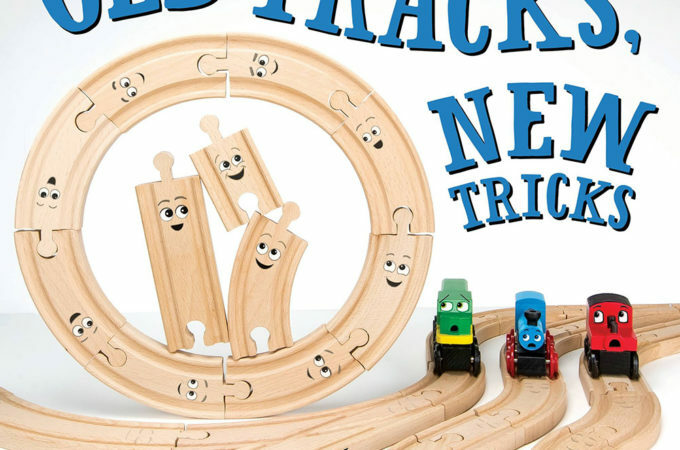 Adding Christmas decorations and freight to even a simple oval of track would be fun. But here’s what we enjoyed about this particular set up. We have a very small, square train table, but I was able to pack a lot of excitement by using multiple levels of elevated tracks spiraling over and under each other. I combined two thirds of the mountain from the Gold Mine Mountain set (a Toys’R’Us exclusive) and a spiral track to accomplish this. Here are Santa and a boy visiting him. The Little Engineer especially liked this part, because he knew we were going to visit Santa ourselves later that day. If you’re interested in the Thomas in the photos, we had just gotten Holiday Lights Thomas, and his blinking Christmas lights made things even more festive. This year, to go with the Santa’s Little Engine DVD (which is now our favorite holiday-themed Thomas DVD), they have a Santa’s Little Engine Thomas, who is dressed up like Rudolph and pulling a freight car with Santa in his sleigh, and the Sidney Special set, featuring the “nice” blue diesel wrapped in Christmas lights and pulling a crate full of more lights. Snowplow Thomas would also be fun here. You can get him in the Adventures of Thomas set. 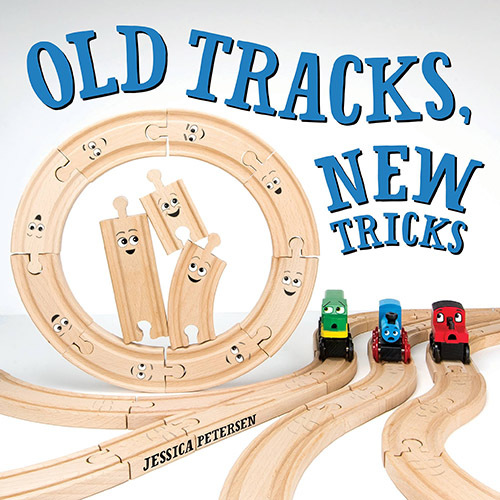 For more inspiration on snowy wooden train layouts, check out the Snow Trains: Seven Ideas for Bringing Snow into Train Play post I mentioned before, and the layouts we made last winter to go with two snowy train books: Valentine’s Day in Vicarstown and Thomas Gets a Snowplow. 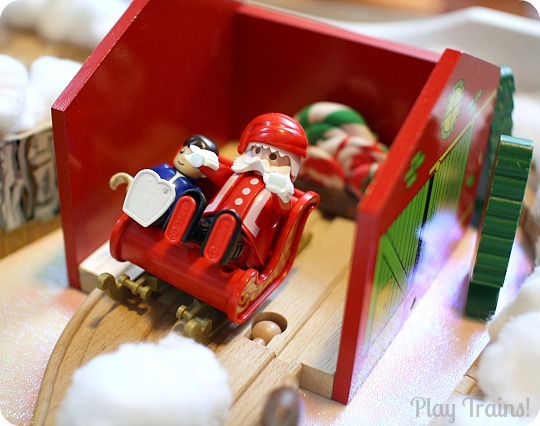 And don’t miss the other Christmas Play Days activities on Play Trains! Love it! 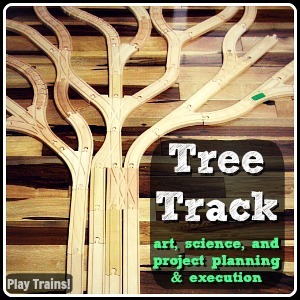 I was just saying we needed to make a new Christmas tree for the train table… but I never thought about turning it all into a winter wonderland. My son will be so excited! This is so cute! 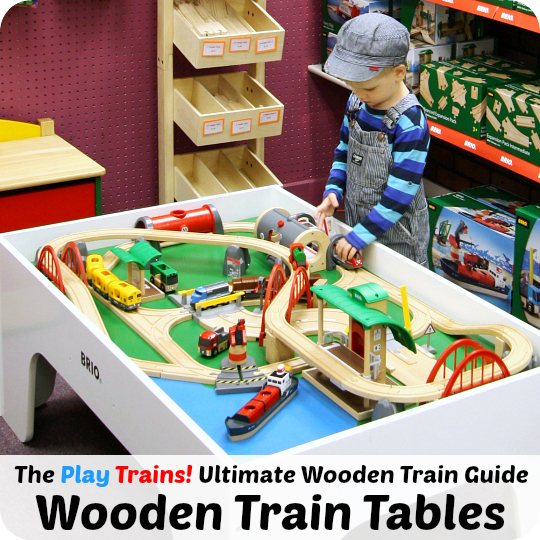 I wish my son was more into trains, then I could play like this!